A lazy afternoon drifting on the river - watching the rabbits row past on their leaves. These tiny bunnies fit anywhere you want a reminder to relax and dream. Handpainted resin; 1 1/4" high. Set of 3. Great service every thing arrived on time, the packing was amazing it could have gone to mars with no damage. So little and so cute! Nice details. Love 'em! These whimsical little bunnies are even cuter when you see them than they are in the catalog. Just what I wanted. Used as a gift. Delightful! I have 2 very good friends and we each have a bunny. I love miniatures and these are worth the money. 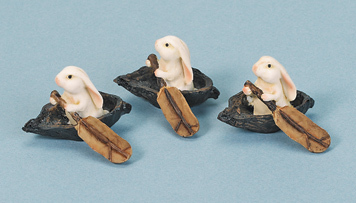 Love your figurine Rabbit rowers!